What’s next for NSW abortion laws? NSW Premier Gladys Berejiklian voted against a foetal personhood bill in 2013. Will she do so again? Queensland doctors and other health professionals should be able to work without fear of prosecution when providing safe and effective abortion care. If we want to win the fight for women, reproductive rights must be the most important front. Heather Douglas (Professor of Law, University of Queensland) and Caroline de Costa (Professor of Obstetrics and Gynaecology, James Cook University) investigate a recent case of a woman being charged with illegally aborting her own pregnancy and question what was gained by this absurd process. To the extent that abortion’s technical status as a criminal offence remains, it's clearly the case that the law is running behind public opinion. One of this group's passions is challenging the legality of abortion exclusion zones. The latest attack on Victoria's abortion laws has failed, but anti-abortion activists have said the war is not over. MPs unite in Queensland and New South Wales to reform outdated abortion laws, write Caroline de Costa, professor of obstetrics and gynaecology, and Heather Douglas, professor of criminal law. Does muzzling anti-abortion protesters infringe freedom of speech? 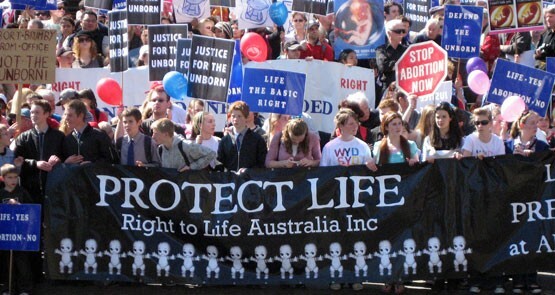 Victoria has passed legislation preventing the harassment of women outside abortion clinics. But does the new law restrict free speech? Crikey intern Jess Davis investigates.